The BeagleBone Black Rev C is a powerful microcontroller with 4GB eMMC flash and the Debian Linux OS. 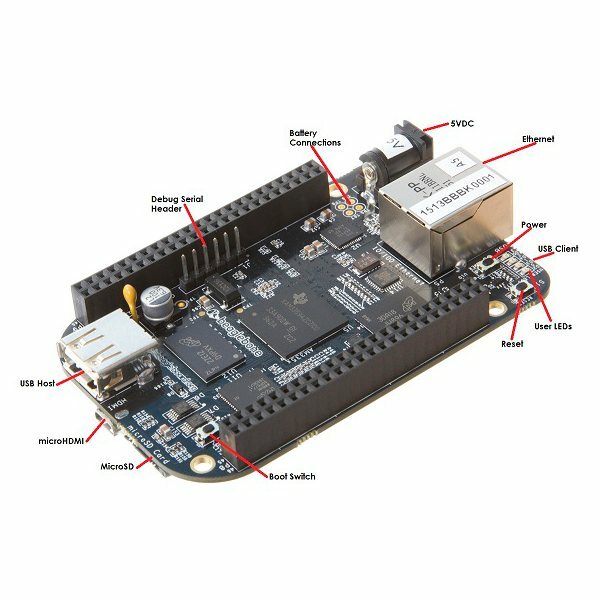 The BeagleBone Black is a small single board computer that makes an excellent brain for advanced robot projects. This embedded microcontroller has a large number of GPIO pins available including analog input channels, SPI, I2C, TTL serial and more. The BeagleBone Black Rev C features TI AM335x ARM Cortex A8 processor running at 1Ghz. It has 512MB of RAM and 4GB of flash for building sophisticated robot software with a microSD card slot for additional storage. Other features include HDMI video and audio outputs, client and host USB and an Ethernet network port. This board comes with Debain Linux OS pre-installed or you can choose to install another OS such as Android or Ubuntu. The BeagleBone Black comes complete with a mini USB to USB Type A cable and a quick start instruction card.